What’s that? Isn’t it English alphabet? Yes it is. But, at the same time, it is the French alphabet as well. Interesting, isn’t it? Now you might be super-excited thinking that you already know the French alphabet? Yes you do but only the written format. Why? Because the letters in French alphabet are pronounced differently. All the letters? Relax. Not all but most of them. 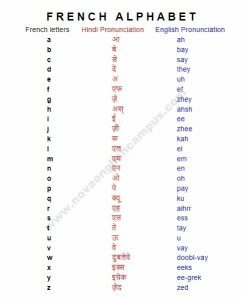 If you are a speaker of Hindi, Urdu, Punjabi or most other Indian languages who can read Hindi and English, the following will help you to learn French alphabet through Hindi in no time. Want to listen to the pronunciation along with explanation in Hindi? Then watch our YouTube video on the same lesson. In French alphabet, you might have noticed that some letters are pronounced almost the same as they are in English alphabet? Which are those letters? F, L, M, N, O, Q and S. A great relief, uh? But please be careful. These letters are pronounced ‘almost’ the same way as they are in English, not exactly the same way. You need to listen to them again and again and observe how slightly different these letters’ pronunciation is. And needless to say, the remaining 19 letters are pronounced in an entirely different way. Some Hindi speakers may find them a bit different and confusing. But remember when a French speaker tries to learn Hindi, they also might have to feel a lot of such difficulties at the beginning. All I want to say is that the new sounds may confuse you a little at first but keep practicing. You can do it! It’s awesome in favor of me to have a web site, which is helpful for my knowledge. particular post amazing. Wonderful task! I visited several websites but the audio quality for audio songs existing at this web page is truly fabulous. Some genuinely fantastic articles on this site, thanks for contribution. “Gratitude is merely the secret hope of further favors.” by La Rochefoucauld. I’ve been exploring for a bit for any high quality articles or blog posts on this sort of house . Exploring in Yahoo I eventually stumbled upon this site. Studying this information So i’m satisfied to show that I’ve a very excellent uncanny feeling I discovered exactly what I needed. I most surely will make sure to do not put out of your mind this website and provides it a look regularly. I precisely had to say thanks all over again. I’m not certain the things I would’ve undertaken without the type of techniques discussed by you over this area of interest. It was before a very horrifying matter for me, but witnessing the very specialized manner you dealt with that forced me to jump for delight. I am happy for the support as well as believe you recognize what a powerful job you were doing educating many others through the use of a site. I’m certain you’ve never got to know any of us. Thanks, I have recently been searching for info approximately this topic for a while and yours is the greatest I’ve discovered till now. However, what about the conclusion? Are you positive in regards to the source?